2. Our Batteries are "GREEN"
Positive environmental benefits from less waste and less toxic waste. up to 4 times faster. of the charge per month. will fit your application before ordering. An advanced, digital Microprocessor-Controlled lithium ion battery can be safely turned off during shipping and installation and can be placed into storage mode. Additionally, only a Lithionics Battery has the NeverDie Power Reserve with energy to spare when needed. Low-Cost imports use lower-grade analog electronics that lack even a simple On/Off switch for safety. Don't be fooled by glamorous stickers! Can a battery be called a "Smart" Battery if it has no buttons? Can you "Rely On" a battery based on stickers and marketing? A. Safety a Must: Ion EXT fire extinguishing technology. No risk of fire. B. Advanced Quality Testing: 100% Load Tested, Certified and Documented Reports including FLIR Thermal Imaging and Impedence Testing. C. Push Button Switches: BMS Power Reset, On/ Off Switch. D. Reliable Service: Batteries are rebuildable, repairable and on site HazMat pickup. E. American Made: Designed, built and backed in the USA. A. Safety at a Cost: Low priced imports sacrifice safety and quality. B. Lack of Verifiable Testing: Be aware of re-labeled imports not engineered and built in the USA. C. No Buttons or Switches: No way to control BMS functions. D. Disreputable Service: Imitation batteries have no programs for returning HazMat packages. E. Low Grade, Low Cost Imports: Not manufactured to high quality standards. This online media is for you! Lithionics Battery and Pinnacle Innovations will always be dedicated to our customers. In doing so, it is important that all customers have access to tools that help them understand the science and benefits of all our products. This library consists of informational documents, illustrations, graphical visuals, and video tutorials. If you would like to submit a new question, please Email Us. What is the life expectancy of a Lithionics battery? What is the NeverDie feature, and what will it do for me? How is lithium better than lead-acid? How are battery sizes defined? Why are lead-acid batteries getting shorter life today? 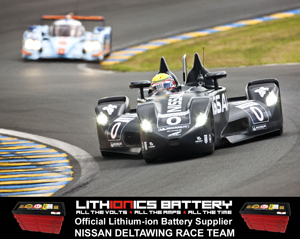 What are the advantages of running a lithium battery in my car? What are the advantages of running lithium batteries in my boat? How do I use the NeverDie? What makes a battery green? 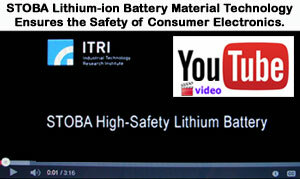 Are all lithium batteries safe? How are batteries rated, and what do the ratings mean? How are lithium batteries shipped in the mail? What is the SOC Meter? Lithionics lithium ion batteries start at 12.8 Volts (nominal voltage is usually 13.6 Volts) and continue at that voltage with NO VOLTAGE SAG until the very end of the cycle. As a result power features such as power windows, power door locks and electric relays operate faster and smoother. ALL ELECTRONICS, including Starters and Alternators will DOUBLE THEIR LIFE-SPAN. Lead Acid batteries start at 12 Volts and suffer "Voltage Sag" to 11V, then 10V, then lower. This puts a terrible strain on Electronics by feeding them "Brown" Voltage. 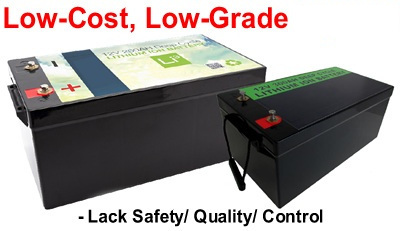 Our lithium ion batteries typically weigh just 10 to 20 lbs Versus 45 to 60 pounds for lead acid batteries. A lighter car is ALWAYS better. This improves handling and performance and helps reduce tire and suspension wear. This is just one reason why Race Car Teams spend big money to reduce weight. A typical lead acid battery weighs 50 to 60 lbs. Not only is this heavy to pick up, this weight is added to your car effecting its performance, handling and adding to the wear and tear of shocks and tires. Our lithium ion batteries typically have a 10 YEAR SERVICE LIFE and a 20 YEAR WORKING LIFE. What this means that one of our batteries equipped with our NeverDie Protection System should last 10 years. After 10 years, we can rebuild your Lithionics Battery to last another 10 years, for a total of 20 Years! Our lithium ion batteries last 2,000 to 3,000 charge cycles at 80% Depth of Discharge and almost 6,000 cycles at 50% Depth of Discharge. Lithium ion does not sulfate which means that a fully discharged lithium ion battery can sit for a year with no harm to the battery. Have the peace of mind by eliminating a potential failure in your vehicle for many years. A typical lead acid battery has 200 to 300 charge cycles before the battery begins to lose charge efficiency, voltage and capacity. When this happens, the battery becomes weaker and weaker and typically needs to be replaced. Also, if a lead acid battery is not used it may "sulfate" and need to be replaced much sooner. Lithionics lithium ion batteries only lose 1% to 2% per month from self discharge during storage. A lead acid battery loses 5% per month. Thus, our lithium ion battery can sit for over 1 year with over 75% of its energy stored and ready to crank your engine. Since vehicles have what is called a "Parasitic Drain", we recommend our optional NeverDie System if your vehicle needs to be stored for several months at a time before uses. The optional NeverDie System also extends your WARRANTY period. Many things can cause early death to a lead acid battery which can leave you stranded at inconvenient times. High temperatures and storage (as little as 90 days) are among the most common reasons for lead acid battery premature death. With our Patented "NeverDie Technology", if an accessory such as an internal light or the headlights were left on, your battery will enter "Sleep Mode" and retain up to 20% of the battery's energy. Simply push the button on the battery (or on the wireless remote) and the battery "wakes up" and is ready to start the engine. Our proprietary Mosfet bridge circuitry prevents over-discharging the battery and as a result, no harm is done to the battery. The result is that you will never be left stranded or in need of a jump start. Human error, such as leaving a light on, can drain a lead acid battery, leaving you stranded. This also harms the lead acid battery and shortens its life. Our lithium ion batteries save you time. Completely sealed with no water levels to check and fill. In fact, our batteries contain no liquid whatsoever, so you can mount our batteries conventionally, on edge, on end and even upside-down! Our batteries use brass terminals that reduce corrosion at terminal posts which means no work and no mess. The water levels in lead acid batteries constantly need to be checked and filled. Also, the lead terminals are continuously corroding and need to be cleaned. When these maintenance procedures are not followed, the battery may fail at any time. Have the satisfaction of knowing that with a Lithionics Battery, you have contributed to a healthier environment. Our batteries are an Environmentally Friendly, Green Battery that are RoHS compliant. In the USA alone, nearly 99 million lead acid car batteries are produced each year. A typical lead acid battery contains about 18 lbs. of lead. Lead is a known poison that is harmful to the environment. Our lithium ion batteries are the perfect choice for all Solar Power battery applications. Our lithium ion batteries are 98% efficient round-trip Versus lead acid batteries that are only 36% efficient. This means you harvest 3 times more Solar Power with our Lithionics Lithium ion Batteries. 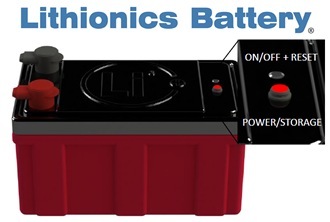 All Lithionics Battery 12 Volt lithium ion batteries require charging at 14.4 Volts to 14.6 Volts and "float charging" at 13.6 Volts. Thus, it is important that your solar power controller has a high voltage cutoff and that your solar power system is capable of charging at 14.4 Volts to 14.6 Volts and "float charging" at 13.6 Volts for optimal charging. Please consult and confirm these requirements before ordering. These requirements also apply to battery chargers and generators used for recharging our lithium ion batteries. For modern inverter-chargers it is normally recommended to use the "CCV" charge setting or alternatively a "Custom" or "GEL" battery setting. Our lithium ion batteries are compatible with all correctly working vehicle alternators running a 12 Volt battery system.